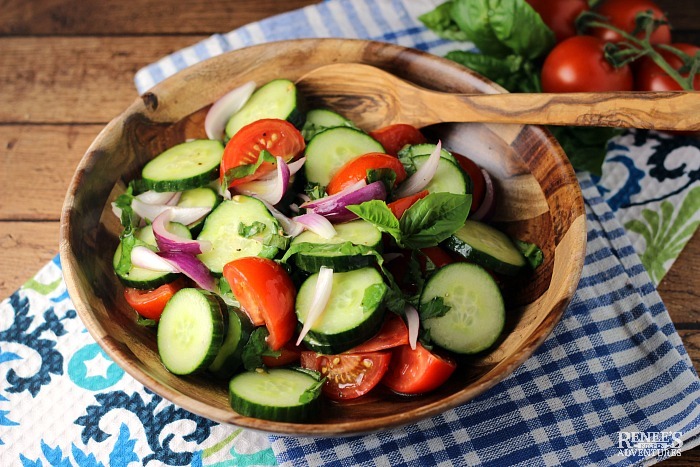 When it comes to summer salads, it doesn't get much easier or seasonal than this Cucumber, Tomato, and Basil Salad! Crisp cucumbers, vine-ripe tomatoes, sweet red onions and fresh basil are all bathed in a light vinaigrette and are ready to compliment just about any meal! 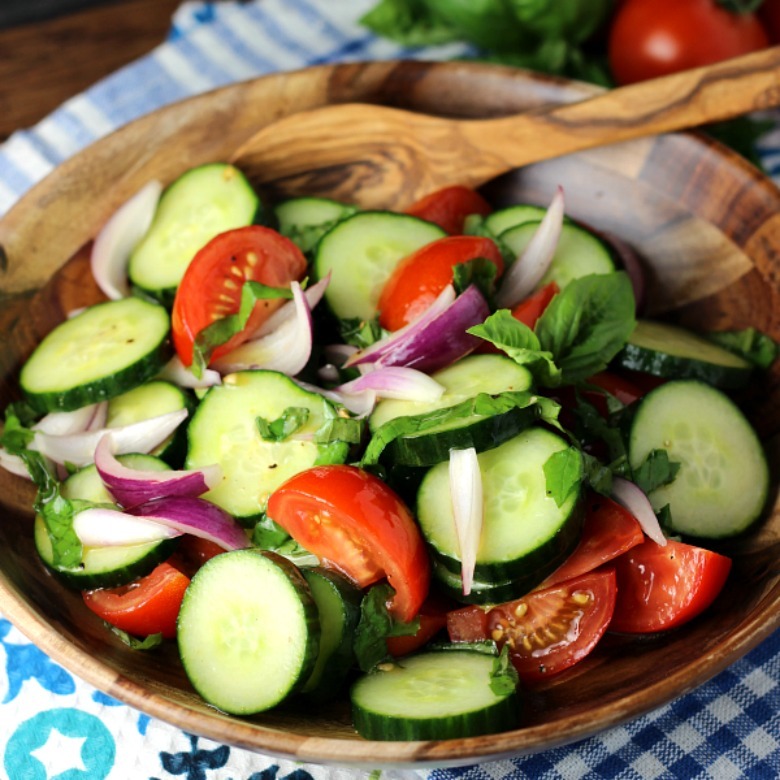 Cucumber, Tomato, and Basil Salad is one of those delicious dishes that comes together in no time. It takes advantage of the produce that is in season during late summer. 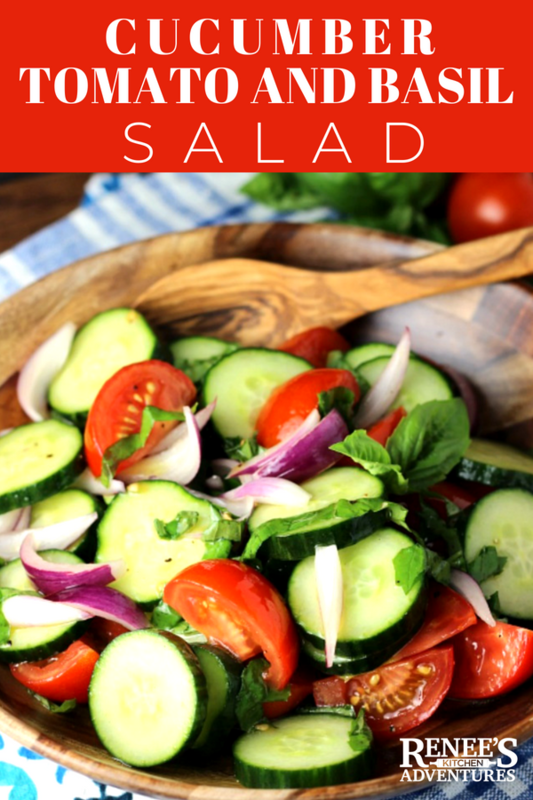 This salad's been a staple in my family's summertime meals for years now...but it's one of those recipes I always debate on sharing. Well, because it's just so simple. But, sometimes these simple recipe inspirations are the best ones to share. Like the time I shared this Easy Summer Fruit Salad or these ridiculously simple Peach and Banana Frozen Fruit Bars. Who doesn't love quick and easy? 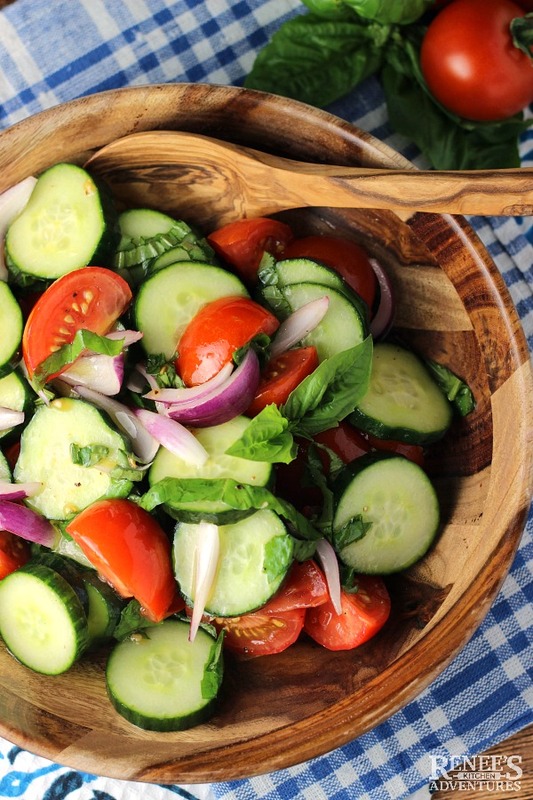 This simple Cucumber, Tomato, and Basil Salad was a creation born from necessity one year. Somehow I managed to grow a bumper crop of tomatoes, cucumbers and basil and was looking for a way to enjoy them all in one dish. So...I created this salad. Fortunately, you don't have to grow your own produce to create this salad. Many farmers markets and grocery stores are selling cucumbers, tomatoes, and basil that may be local to your area! Even if they don't have local produce available, this time of year yields the best tasting tomatoes, in my opinion. So, there's really nothing stopping you from giving this one a try! I have been known to eat this salad, and only this salad, for lunch in the summertime. But it also is a great accompaniment to just about anything you cook up and goes especially good alongside grilled protein...like steak or chicken! Give my version of Cucumber, Tomato, and Basil Salad a try this season, and come back and let me know what you think! Crisp cucumbers, vine-ripe tomatoes, sweet red onions and fresh basil are all bathed in a light vinaigrette and are ready to compliment just about any meal! In large bowl, combine red wine vinegar and Dijon mustard with a whisk. Whisk in olive oil until combined. Add cucumbers, tomatoes, and red onion to vinaigrette. Toss gently. Season with salt and pepper. Gently toss in fresh basil. Cover and refrigerate for at least 30 minutes before serving to allow flavors to combine. Can be served cold or at room temperature. Pin it to your "Salads" or "Summer" Pinterest boards!